I was given a generous space to display my models. It was the first time that I been placed in this position and I am going to see if I can have it for next year. If I do get to stay there I am going to look at displaying my models differently. I have always wanted a painted back drop and with a display stand this size that idea would work. I'm going to be displaying my miniature gourd models at the Gold Coast Show this weekend. At Parklands on the 2nd, 3rd and 4th of September. I shall be introuducing a new line that I hope people will want to purchase. Above is a photo of just two of the 15 or more houses I shall be bringing along. 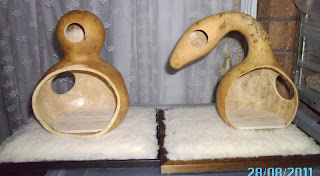 For the six years I have been displaying my big modles at the show people have always admired them and wanted to know where they could buy gourds from. The answer to that is either Toowoomba or Maitland NSW. 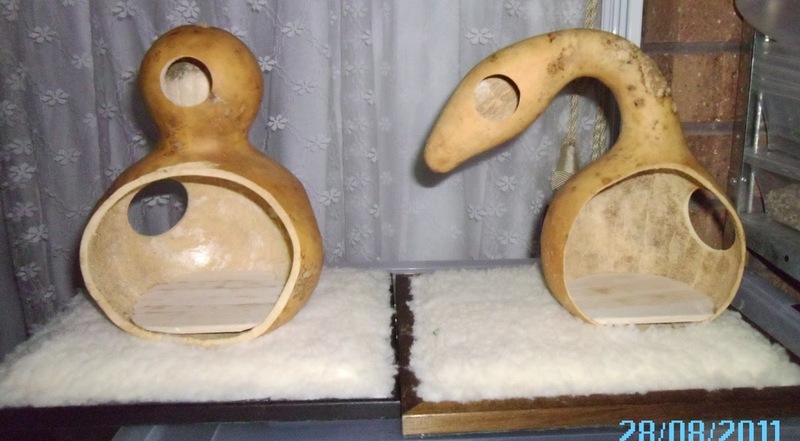 There are not many people who could be bothered to track them down soo I thought, or rather I should say my partner Garry thought, I should make them like this (above) and then all people have to do is decorated them. Wholla! When I have the time I while include some photos of past shows but I'm off to finish the houses as there is soo much to do before the show. See you there.